Unfortunately the "$250 Amazon Gift Card from Just Free Stuff" offer is no longer available. Meet all of your entertainment, fashion, and business needs at Amazon.com, where savvy web shoppers go to get great deals 24/7. Simply register as a free member with Just Free Stuff and you'll be entered to win a $250 Amazon gift card. Save the legwork of getting the best deals and use the website where the lowest prices are at your fingertips. Online since 1995, Amazon offers everything from books and electronics to tennis rackets and diamond jewelry. Their sellers are small & large retailers, as well as individual sellers, working on a platform that is consistent and trustworthy. Get great deals on top products like Nikon cameras, iPads, PlayStations, Samsung flat screen televisions, Kindle Fire eReaders, and more from this top online retailer. Amazon Prime has amped their game with Amazon Prime, a subscription service that allows members to watch unlimited, instant streaming of over 25,000 movies and TV shows and get instant access to eBooks for their eReaders. In addition, they also get free two-day shipping on anything over $25 that they order from the online retailing giant. At an annual rate of $79, membership can be shared amongst multiple users. Just Free Stuff is making sure one new member gets something awesome for free from the Amazon store or gets unlimited streaming and free shipping with an Amazon Prime membership by giving away a $250 Amazon gift card. 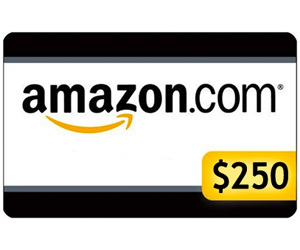 Register on the Just Free Stuff website before the giveaway ends on October 31st, 2016 and you'll automatically be entered to win a $250 Amazon gift card.